Many of you have probably heard of Humans of New York, the photo project featuring portraits and interviews of people seen on the streets of New York. The site has grown in popularity so much so that it has inspired a wealth of offshoots for various other cities around the world. One such offshoot is Humans of Paris. 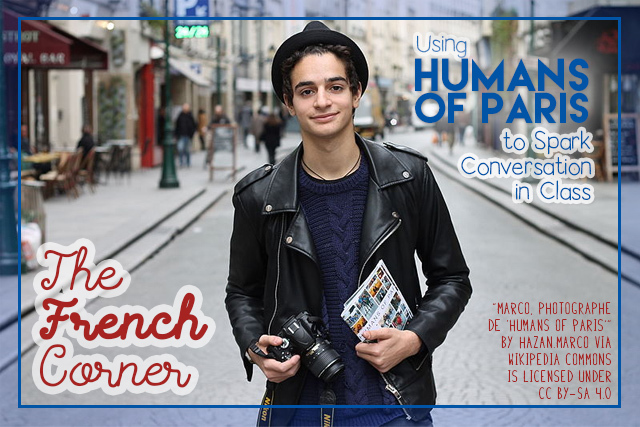 I recently decided to use Humans of Paris as photo prompts in class. After they had a few minutes to discuss, the groups presented their inferences to the class. Then we actually read the caption that appeared with the photo on social media. The captions are in both French and English. Sometimes the students had inferred correctly about the people in the photos, and other times they learned interesting facts that couldn't be inferred from the photo. I liked using Humans of Paris as a prompt, because it was more authentic than just stock photos, but also because the actual captions made the activity more interesting. Students enjoyed reading the stories behind the people in the photos. I made an effort to pre-select photos that would elicit the vocabulary and structures we were reviewing, but also whose captions were relatively easy for them to read in French. The great thing about Humans of Paris is that you can use it at any level. I'm interested to hear how YOU might use this in your French classroom? I absolutely love this idea! What a great way of incorporating authentic text in the classroom:) all students are aware of 'humans of NY' and I'm sure they will love this activity - I'm thinking about doing this every other week in class as a starter :) merci beaucoup! Thank you for sharing your ideas - your are an inspiration!